She'd never felt grass before in her whole life. 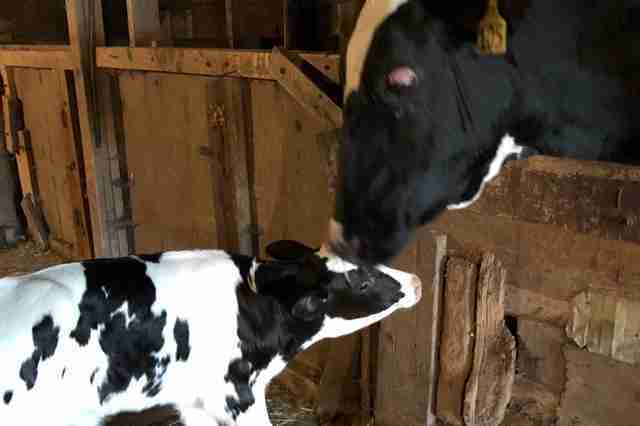 After a 12-year-old cow gave birth to her last baby over a year ago, she didn't manage to get pregnant again — and that meant the end of her life. That's because this old cow, who is also totally blind, was part of an industrial dairy farm, where she had lived her whole life. She had never even been allowed to go outside. And once she stopped being able to have babies and lactate, she no longer served a purpose. 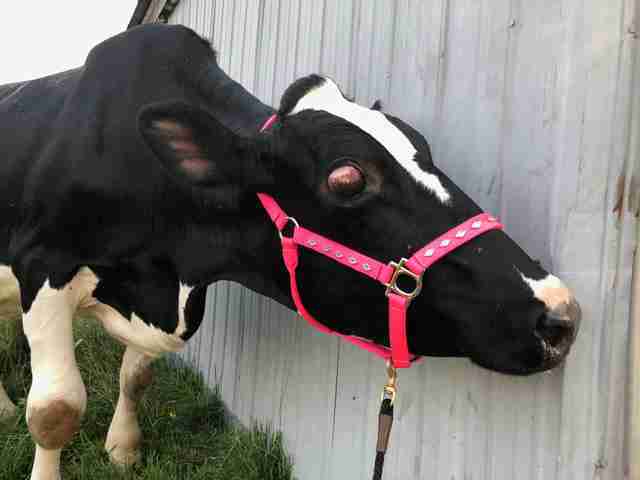 She was being sent to slaughter when she had an incredible stroke of luck. 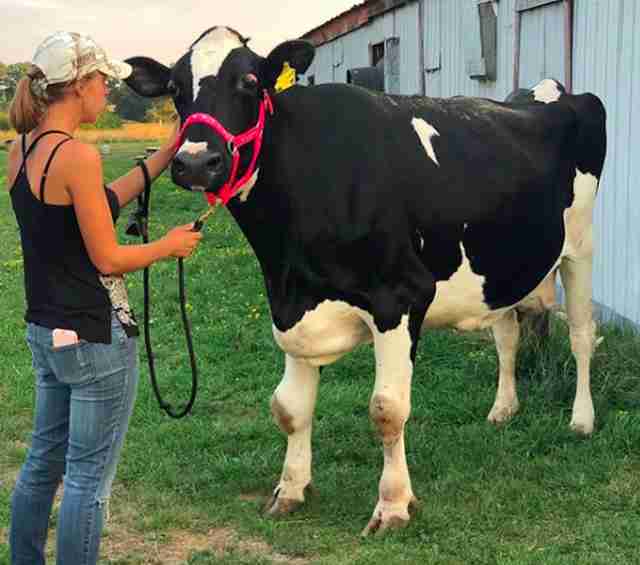 The people at Black Goat Farm and Sanctuary in Ontario, Canada, heard that the old cow was going to be killed — and so they offered to take her to their sanctuary. On Thursday, she arrived and took her first steps out onto fresh grass in her entire life. 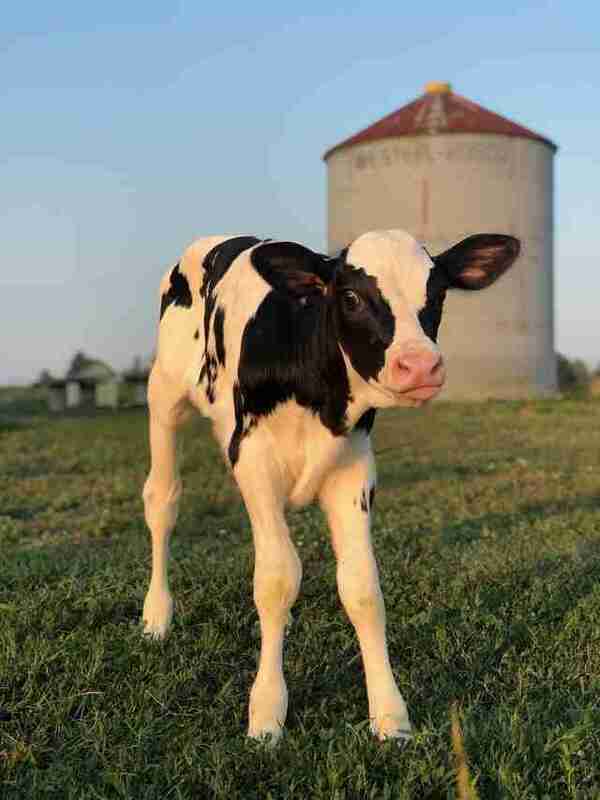 "She was a dairy cow for 12 years. She’s never been outside," Megan Mostacci, cofounder of the sanctuary, told The Dodo. 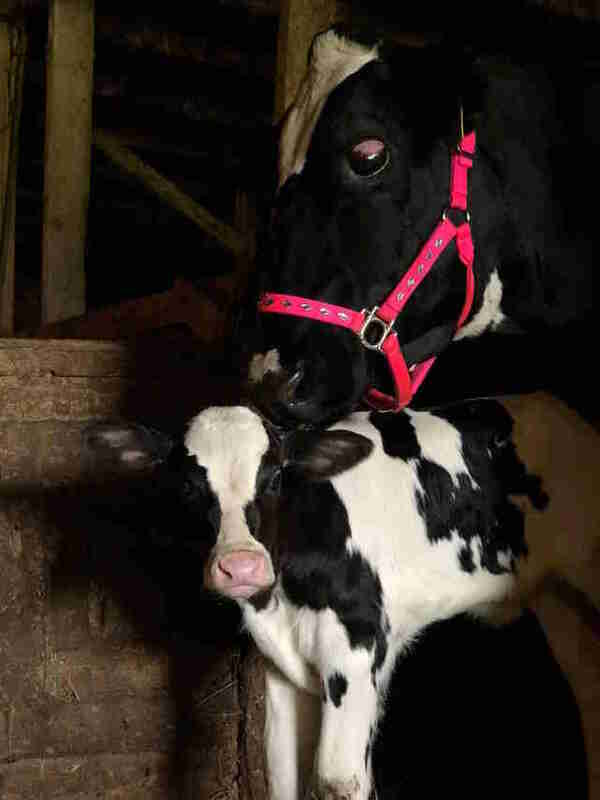 "She has had at least 10 babies and at this dairy farm they take them away right away. They never get to clean their babies or let them nurse. She has also been blind her entire life — can’t see one bit." The old cow sniffed the fresh air enthusiastically as she took her first cautious steps onto the sanctuary grounds. Her joints are swollen, too, since she was kept in small spaces for her whole life. When the old blind cow arrived in the truck on Thursday, her rescuers were also surprised to find that she wasn't alone. "When the truck came there was also a 24-hour-old calf on the truck," Mostacci said. "That farm doesn’t raise them so she was a burden. She was taken from her mama as soon as she was born." As the old blind cow sniffed the fresh air and felt the sun on her fur for the first time, the baby cow couldn't stop running around and stretching her legs. No one can know for certain what they thought of the recent change in both their lives, but both animals seemed to finally be able to breathe more easily. But after so many years living in a place where separating calves from their mothers is a logistical necessity, perhaps the most significant change was the opportunity to finally be with each other. The old blind cow and the newborn calf had already grown attached to each other in the truck on the way to the sanctuary. At night, Mostacci heard the pair mooing to each other across the aisle in the barn. "So we let baby out to sniff Mama over the stall door," Mostacci said. 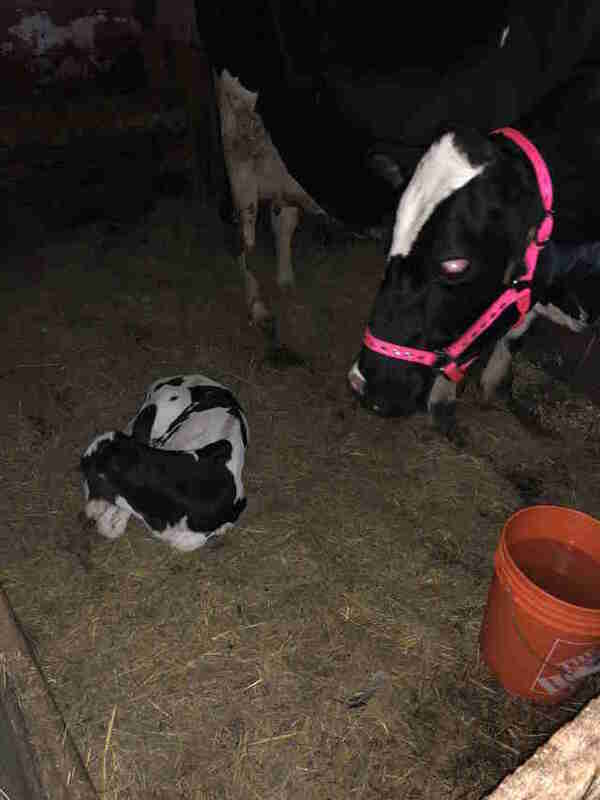 "Both seemed happy so we let baby go in and she started nursing." 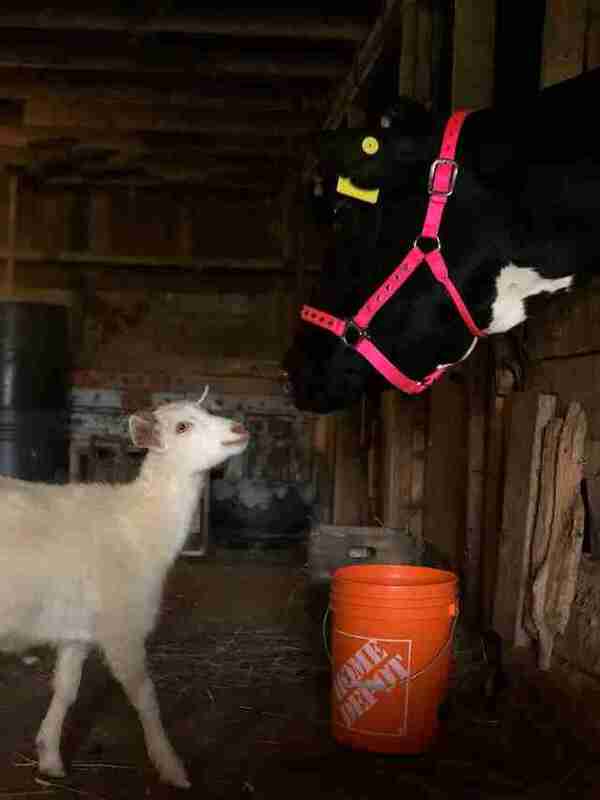 Because the elderly cow is blind, rescuers know that they can't leave the tiny baby alone with her, so they do the next best thing: They bring the baby to visit the old cow at least six times per day. "Mama has never had a baby nurse or ever been able to spend any time with the countless ones she’s had. She was so happy, licking the baby's back," Mostacci said. "They have adopted each other as family and are so sweet together." The baby cow had pneumonia when she first arrived and was getting treated before she could meet another special resident at the sanctuary who was rescued just a few weeks ago: Calvin, a boy calf who was saved from a dairy farm and who has since bonded with one of the resident dogs at Black Goat. The old blind cow stays close to her adopted baby whenever she can while she gains her strength. Hopefully the baby calf gets fully better soon, especially since Mostacci has big plans for the little rescued herd of cows. "We are raising funds to fence in 2 acres for blind Mama, baby and Calvin," she said. "We will have to completely level the ground there so that Mama doesn’t trip or hurt herself. We also need a big run-in shelter for them all. Construction on everything should start this week." 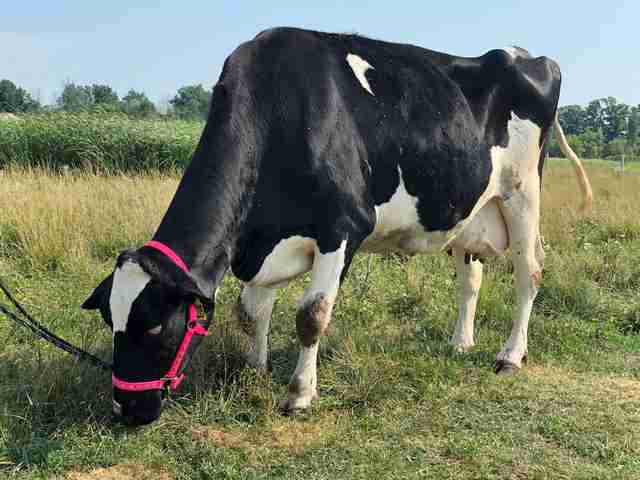 While the "cow haven" is being planned and built, Mostacci and her husband are making sure that the old blind cow, whom they still need to name ("We still don't have a name," she told The Dodo when asked about the rescue for the article, "it's extremely hard! "), is getting as much time outside as she can, to make up for all those years she had to stay shut indoors. "We walk Mama each evening so she can get some exercise," Mostacci said. "She’s weak since literally her whole life she has only been able to stand and lie down (she was in a stanchion). She’s getting stronger already and even trying to jump around." Already, a few of the other residents at the farm sanctuary have introduced themselves to the old blind cow. And Mostacci and her husband are particularly looking forward to when all three cows can be together in the cow haven. On Tuesday afternoon, Calvin was allowed to meet his little sister — immediately upon seeing Calvin, the little calf jumped for joy. Then Calvin went over and booped her nose with his. Life is certainly starting off well for these little calves, who nearly didn't survive at all. And hopefully they will bring a lot of joy and light into the life of the old blind cow — who will have a name any day now — in the future. 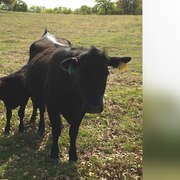 You can help Black Goat Farm and Sanctuary create its very own cow haven for the three cows it has saved by making a donation.